Kittens Gone Lentil: VeganMoFo 2016 #1: Pizza party! Hello everyone and welcome to VeganMoFo 2016! I am so excited to be taking part in another great year of vegan food fun times on the internet. This year, I am going to be following along with the daily prompts again. I had a lot of fun with them last year! I'll be sharing a mix of round ups, eating out and cookbook fun times this month, so I hope you enjoy! For the first day, they ask us to share our favourite food. This is hard, because I love many many many foods! But there is one that I am always excited about (even though I don't have it very often... I must change this). When everyone was arguing about tacos vs burritos last year (I am burrito, sorry tacos), I knew there was one food that could eclipse them all. Pizza! Is there anything really that is better? You can put anything on a pizza, so any other favourite food can be turned into a delicious topping. And then you can eat it as a pizza. And then the next day you can eat the leftovers cold, which is something I love about pizza. People who reheat their leftover pizza... why you so strange? I am sharing a short round up of some of my favourite pizzas, both purchased and made. But there are so many more I could share! 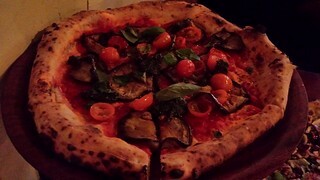 One pizza I dream about on a regular basis is the Melanzane Pizza from Gigi in Sydney. This pizza is life changing! So delicious, so simple, so needs to be in my mouth right now! I've had it three times (once at each visit) and it never disappoints. Last year when I went to Austin for VVC, I was so excited to try the Detroit-style pizza from Via 313. 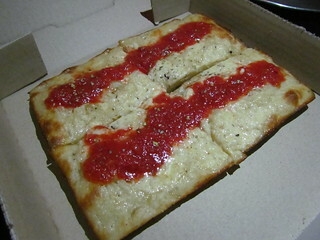 I got their classic cheese pizza (with vegan cheese), and it was really delicious. Definitely lived up to the hype! 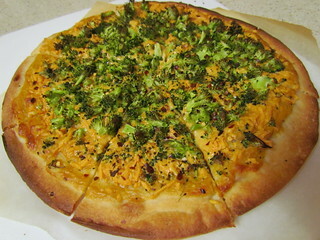 Here is one I made, the Broccoli and Cheddar pizza from Vegan Pizza by Julie Hasson. If you love pizza you need this book! It has my go-to dough recipe in it. 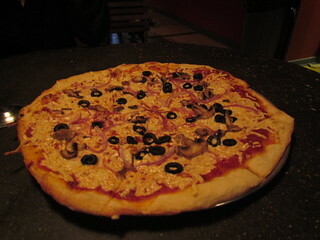 I love Seattle, and if you love pizza and are in Seattle you must visit Pizza Pi! 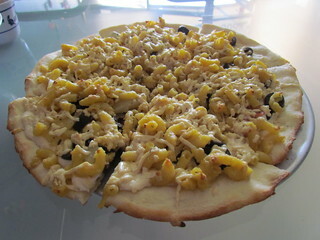 Last time I got their Mac and Yeese (mac and cheese, Yves canadian bacon), and I added pineapple and black olive to it to make a Mac and Cheese Hawaiian pizza... so trashy, so delicious! And of course, one cannot forget Sizzle Pie! This delicious pizza was worth burning my mouth for at 1am after a late flight into Portland. And now they have a shop in Seattle as well! Oh pizza, I love you! There are a few places in Brisbane that have vegan pizza that I am very keen to go and try out. I will report back when they do! What is your favourite pizza topping? Do you love cold leftover pizza as much as I do? For this year's MoFo kitty theme, I thought I would share with you all the beautiful cats who have shared my life. There are eight in total, from my very first kitty through to my current beloveds. 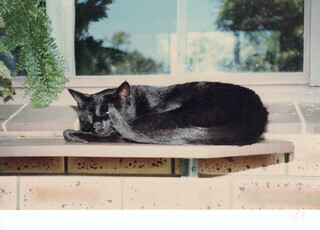 That very first kitty was called Mo, and she was a beautiful little black cat. She is responsible for my love of cats, and for my soft spot for black cats! This post is killing me! I've been wanting to make pizza for months now, because it is amazing, but also because I want to snap a pic of it alongside a "vegan pizza gang" pin a friend of mine gave me. Those pizzas look sooooooo amazing! I quite like cold pizza. When I was a kid, we would have leftover pizza for breakfast at times. It sounds terrible, but we had very good eating habits in the house. I swear! If you have cold leftover pizza, breakfast is the best time to eat it! I love the sound of your pin. Happy MoFo! That mac and yeese pizza looks sensational. I very rarely eat pizza too, despite how much I love it. You've inspired me to have it more often! I have inspired me to have it more often as well. Eating more pizza can never be a bad thing. Piiiiiiiiiiizzzaaa! Yum! Mo looks adorable. I love pizza in all formats! I love it hot, I love it cold, sometimes I reheat my leftovers. Whatever, if it's pizza I'm in! That Hawaiian mac & cheese pizza is such a good idea and I miss the Via313 pizza most days, there's nothing like that anywhere in Europe. I think the Hawaiian Mac and Cheese was my masterstroke in pizza creation. The Via313 pizza was so great. Broccoli and cheddar is such a great combo. I'm one of those poor unfortunates that don't really love pizza, but this post is persuading me that maybe I've got it wrong all these years! Mac and cheese pizza in particular sounds so wrong, yet so right! Okay, I've been to Seattle twice and STILL haven't been to Pizza Pi, but I had no idea they had MAC AND CHEESE PIZZA. Now I'm just sad. Also, that Detroit pizza in Austin was amazing! Definitely be sure to hit it up next time you are there! "Pizza! Is there anything really that is better?" Ha - I had a tough one with this because it was tied between pizza & pasta. I went with pasta, but I really love pizza too. Apparently I'm strange though because I like to reheat my leftover pizza... though there is rarely any leftover haha. Oh that mac and cheese pizza! That looks insane! This post is making me hungry despite the fact that I literally just finished eating lunch! Hmmm... reheated leftovers? You are missing out! Mushrooms are amazing, they are not boring at all. Finally catching up with blog posts that I made it into Vegan Mofo XD I love pizza, and always reheat leftovers... except with a tomato pie. So good cold. I think maybe it is because daiya doesn't taste so great cold? I don't mind the Daiya cold if it has already been cooked. Though eating raw Daiya shreds is gross. There are so many MoFo posts to get through!